This Rotabin unit is 34" diameter and 49-3/4" tall. It has 6 rotating shelves with 5 compartments each (a total of 30 compartments). Each shelf has a capacity of 500 lbs. Rotabins find usable space where none existed before and bring parts right to the picker. By concentrating bulk parts into less space than traditional linear shelving, Rotabin revolving bins use every inch of space. Rotabins consist of a series of circular revolving steel shelves, dividable into triangular bins, mounted in stacks (shelves) on a vertical post. 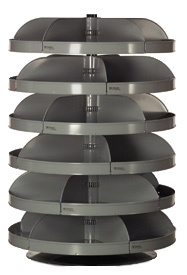 34" diameter unit is designed with one-piece bottom disc, flanged and beaded for rigidity. Five permanent dividers make compartments that are 21" wide, 15" deep, and 7" high. 2-3/8" bin fronts are removable. Capacity is 500 lbs. per shelf. Perfect for screws, fittings, or accessory storage.